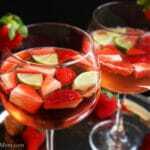 This Strawberry Gin Spritzer is perfect for any celebration. It’s made with just the right combination of strawberry gin, lemonade, and prosecco. In a large bowl style wine glass, add 1 shot of vodka to each glass. Next, add the lemonade to each glass. Top off each glass with prosecco. Add lime and strawberry slices.